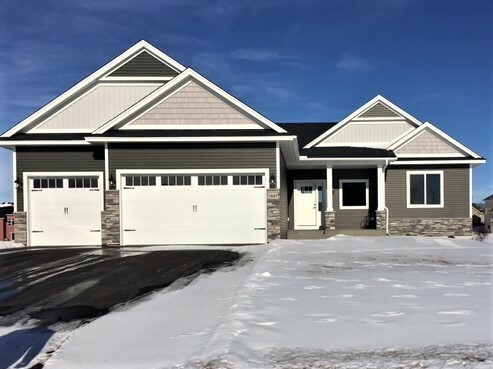 Stunning Rambler model home is complete and built by CaliberHomes! 1083 166th Ave NW Andover MN 55304 OPEN HOUSE THURSDAY THRUSUNDAY 12-6! PARADE of HOMES MODEL #159! Home for sale in Andover! Enter this Caliber built home from the covered front concrete porch. The foyer is large and bright with white enamel woodwork and metal spindles perfectly spaced in the railing. The kitchen is loaded with tons of storage and natural stone enhances the expanse of counter space. Impressive ceramic covers the backsplash and adds a hint of modern style. A hidden walk-in pantry keeps things organized and out of sight. Grab a snack to enjoy at the additional counter seating or the casual dining space as you gaze out at the view beyond. A gas burning fireplace rests quietly in the corner of the generous living room and is ensconced in stunning stone. Cozy up to it on the chilly Minnesota winters! 3 bountiful bedrooms complete the dwelling- the master suite is on the main floor and has a California walk-in closet, and a private luxurious bath. Relax the stresses of the day away in the corner jetted tub! The kitchen is loaded with tons of storage and counter space. A hidden pantry keeps things organized and out of sight. Grab a snack and enjoy it at the counter seating or the informal dining room as you gaze out at the view beyond. A gas burning fireplace rests quietly in the corner of the large living room and is ensconced in stunning stone. Cozy up to it on the chilly Minnesota winters! Built by the 2015 & 2016 Reggie Award winning home builder! Plan review directly with the President. Final walk-through with the President. Home closing with the President.